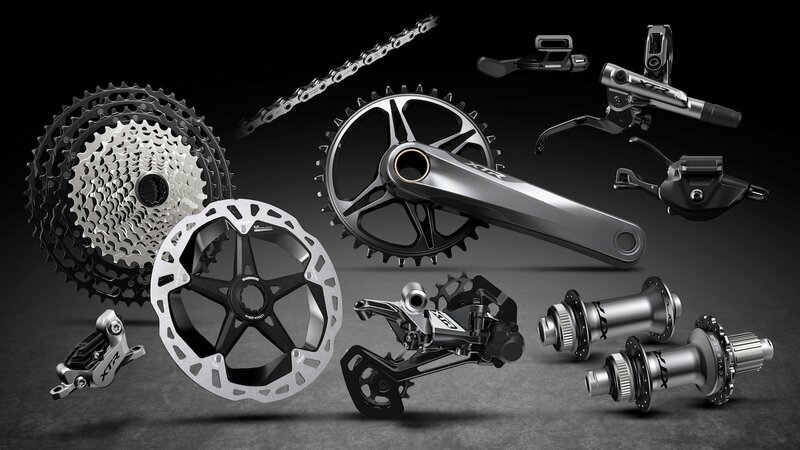 After the succession of indiscretions, assumptions and conjectures, finally the long wait is over and Shimano officially presents the new XTR group that includes many new features. 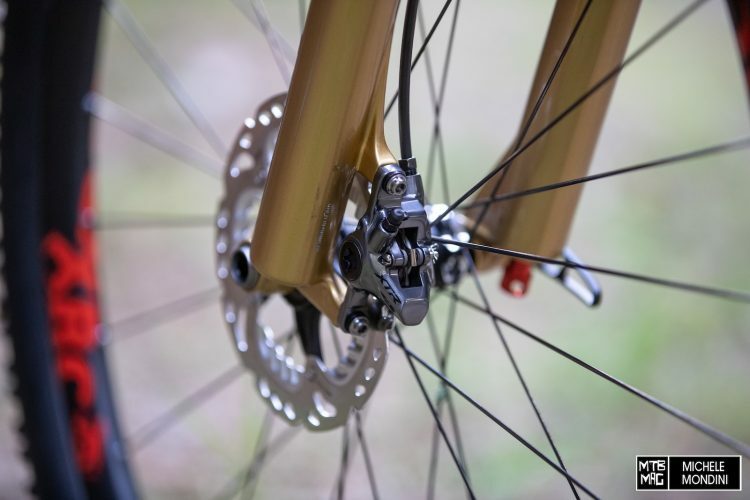 The most striking piece of the group is the 12-speed drivetrain with new cranksets, new derailleur and especially new cassettes with either a 10-51t or a 10-45t range, which, a sore point, need a special, dedicated rear hub. So far, only DT Swiss has the license to use this hub on their wheels. Interesting news also for the integration of brake and shifter levers on the handlebars thanks to the new I-SPEC-EV system. Updates also for the brakes, which are now available with both 2 and 4 piston calipers. Find out more about the new features of the new XTR group in the official press release below and get all your questions answered in the Q&A section at the end of this article, with the photos of Jolanda Neff’s bike with the new drivetrain. Here you can find all the weights. [Press Release] – If there’s one thing certain in life it’s that the MTB world continues to push boundaries. Mountain bike racing develops year on year with courses becoming more demanding and bikes becoming more capable. 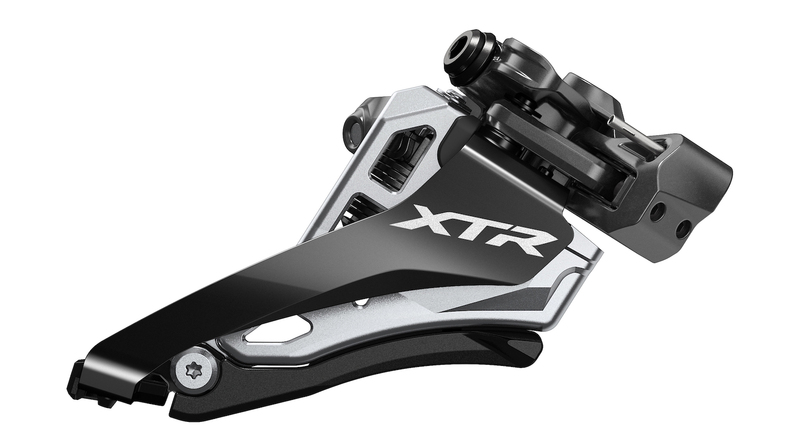 Whether riders need the lightest set up, the most control over their bikes or the most versatile drivetrain for any situation, new XTR has taken that development challenge further than ever with a host of component developments to give MTB racers the speed, focus and control for victory. 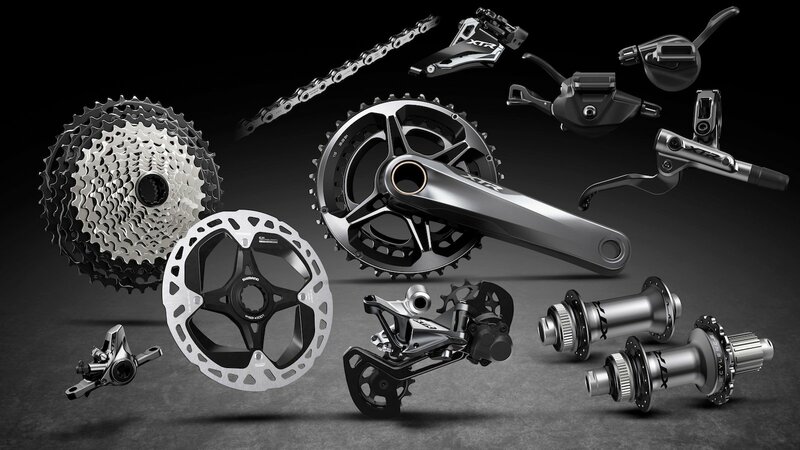 XC, Marathon and Enduro racers demand a fine balance of speed, focus and control so each has been analysed and optimized in the development of SHIMANO’s XTR M9100 Series. 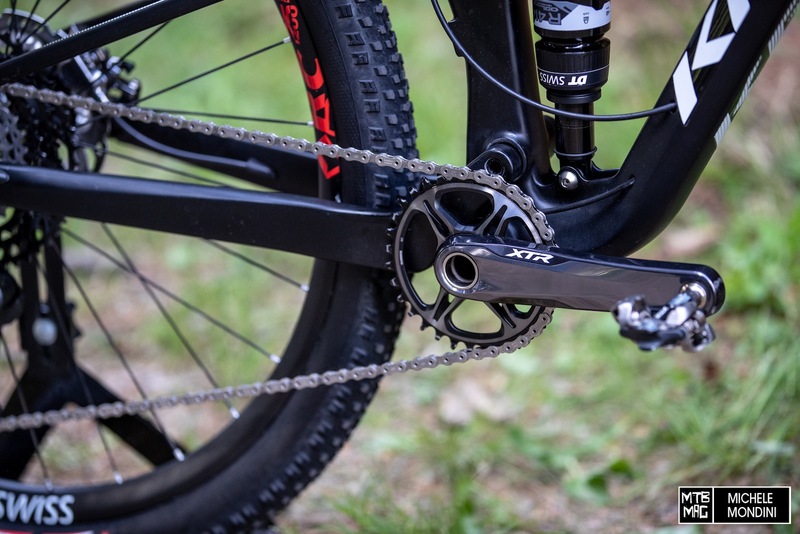 New XTR features a groundbreaking 12-speed cassette with either a 10-45T or 10-51T range, 2- or 4-piston brakes, and a new hub featuring SHIMANO’s new MICRO SPLINE technology. 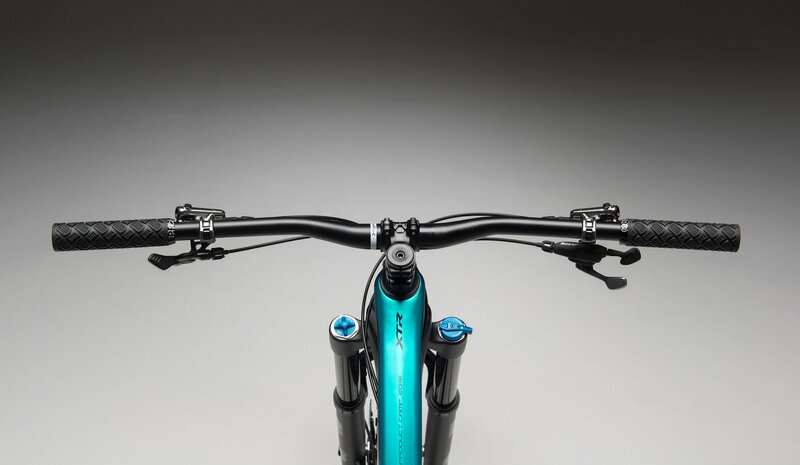 As well as that comes a new design of brake and lever mounts allowing riders to position their controls, including an XTR dropper post lever, in the optimum position for comfort and rapid action. 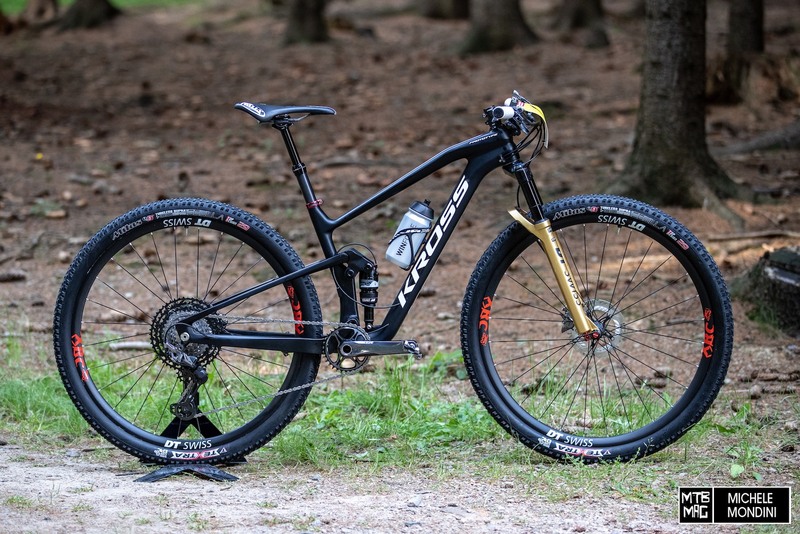 Altogether the new developments save over 150g in weight for XC rider or over 90g for Enduro riders and promise a more intuitive shifting set up for enhanced focus on the trail. Developments in the drivetrain started from the position of minimizing gear change steps to give riders the optimum rhythm and cadence between each gear and ultimately the most overall speed. The result of this was the 51T sprocket, which comes after equal gear steps of 6T in the last three sprockets (10-12-14-16-18-21-24-28-33-39-45-51T) for an even cadence. 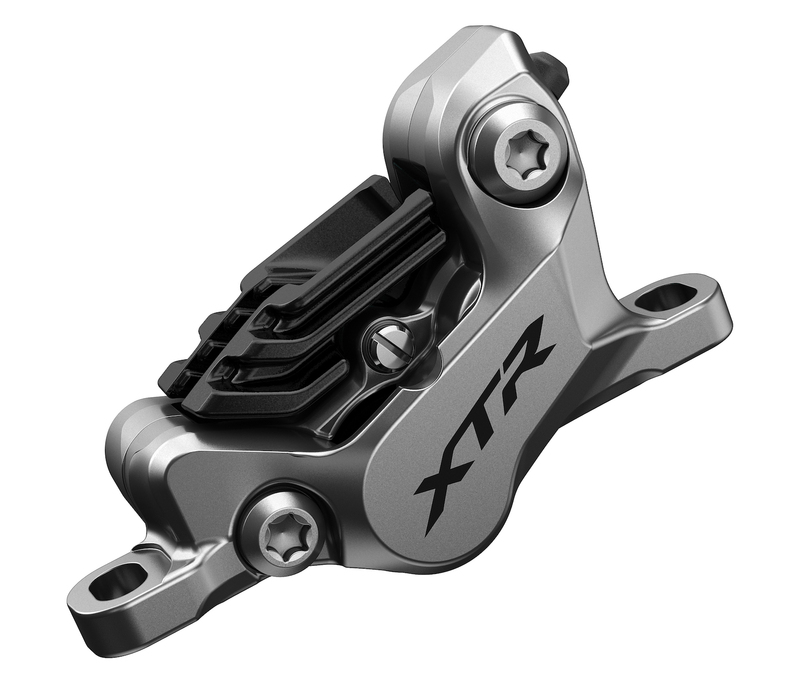 XTR also introduces a 10-45T 12-speed cassette (10-12-14-16-18-21-24-28-32-36-40-45T) for faster or less steep MTB courses and less cadence shock. 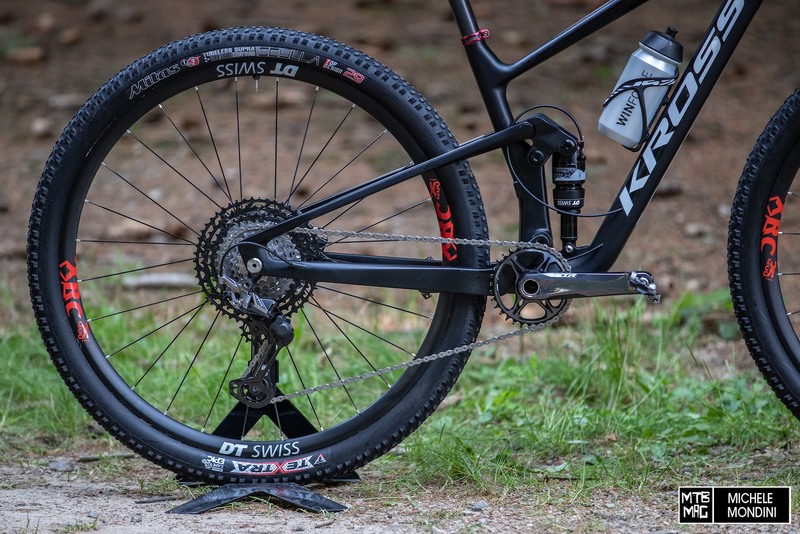 The 10-45T (CS-M9100-12) is for XC riders wanting small gear steps and the lightest set up, the 10-51T (CS-M9100-12) is for the trail rider to climb every mountain they face. Both cassettes use strikingly different metals for different sprockets to allow the best balance of weight and durability. The largest sprockets use aluminium, the middle use titanium and the smallest use steel. A third cassette option (CS-M9110-11) comes with new XTR for riders specifically looking to create a stiffer and lighter wheel set. 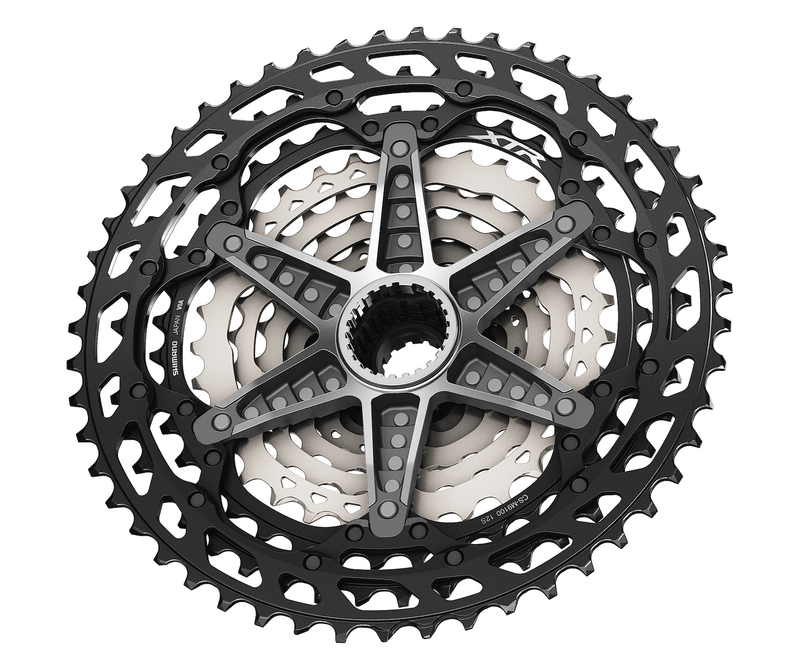 Essentially this option is based on the 10-51T cassette with the 51T sprocket removed to create an 11-speed cassette with 12-speed gear spacing. The benefit of this option is that it gives riders the chance to create a lighter bike and stiffer wheels which can be used with the same chain and shifter that the 12-speed set-up uses. 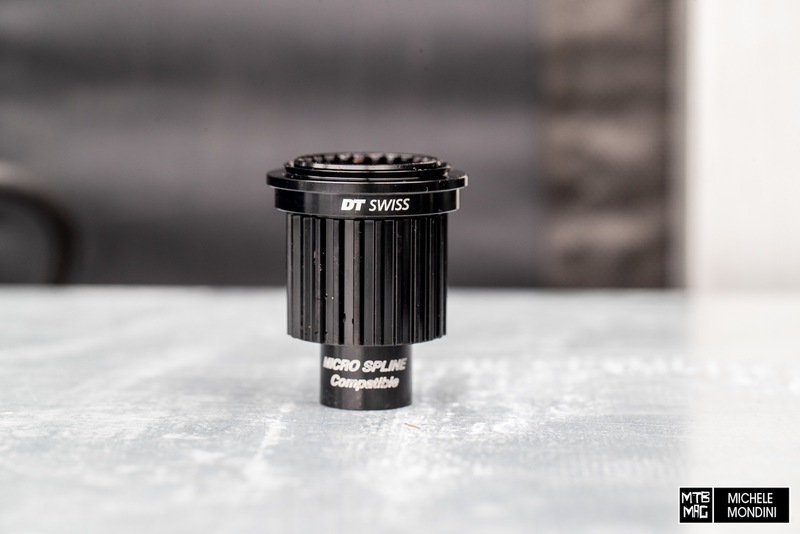 To fit the 12-speed set up SHIMANO restructured the FREEHUB design with what’s known as MICRO SPLINE technology to fit the cassette. As well as that comes the introduction of SCYLENCE technology in Shimano’s rear hub. This new technology replaces the pawls with a ratchet system to reduce drag whilst coasting and create a virtually silent hub so you can focus more on the trail ahead. Front hubs are available in 100 or 110 mm spacing with a 15 mm thru-axle and rear hubs come in 142 or 148mm (Boost specification) with a 12 mm thru-axle (HB-M9110/-B / FH-M9110/-B). Alongside a dedicated 12-speed chain (CN-M9100) with a 12-speed QUICK LINK comes a 12-speed crankset (FC-M9100/M9120-1) with that famous hollow crank arm. XC 1×12-speed riders are well catered for with a wide range of direct mount chainrings saving up to 80 g in weight and available from 30T-38T. 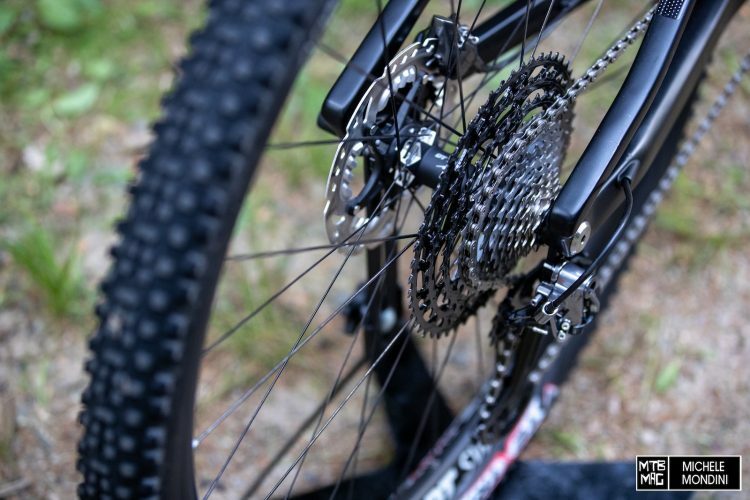 Enduro riders running 1×12-speed can add the XTR chain device (SM-CD800 E mount, D mount or ISCG05 type) to aid chain retention and they have the option of the FC-M9120 crankset with a wider Q-factor to fit particular frame dimensions. Riders who want the biggest gear range and control in all types of terrain have the option of a 2×12-speed crankset (FC-M9100/M9120-B2) in 38-28T that can be paired with the 10-45T cassette for the maximum gear range and close gear steps for long races with lots of climbing. Three rear derailleurs are available at XTR level (the RD-M9100-SGS/GS long cage or short cage style or the RD-M9120-SGS double chainring long cage style), all with a sleek, aggressive and angular anodized aluminium design. To aid shifting performance the pulley wheels go from 11T at XTR M9000 to a larger 13T size to increase chain retention and together with the rear derailleur’s SHIMANO SHADOW RD+ design, helps minimize chain bounce. Meanwhile the front derailleur is also available in three different styles depending on your frame. The D-type, E-type and M-type mounts all feature SIDE SWING technology for effortlessly smooth front shifting. The theory behind the shifter design was to allow riders to instantly adapt to rapidly changing conditions with improved cockpit integration for shave crucial tenths of seconds from each operation. That has been achieved through the creation of an I-SPEC EV design, which is the system by which handlebar controls can be mounted together. 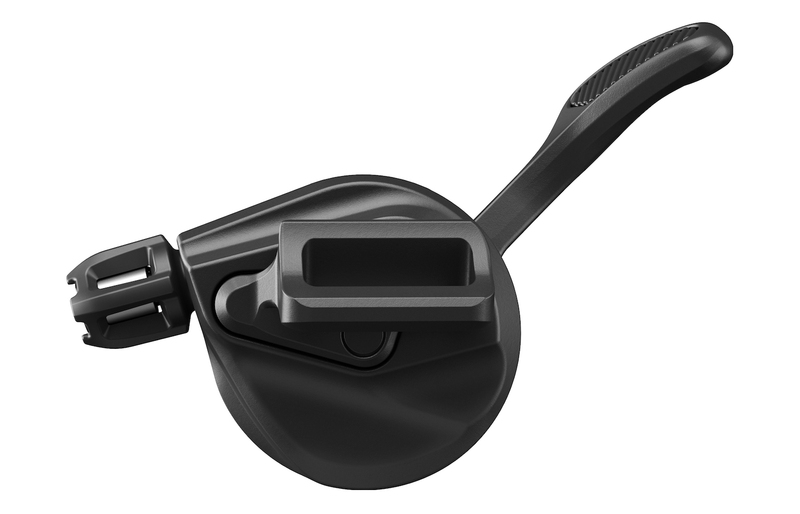 The new I-SPEC-EV designs give 14 mm of lateral sliding range and 60 degrees of rotational positioning so riders can find their most ergonomic hand position on the shifters and levers and have clutter-free handlebars. 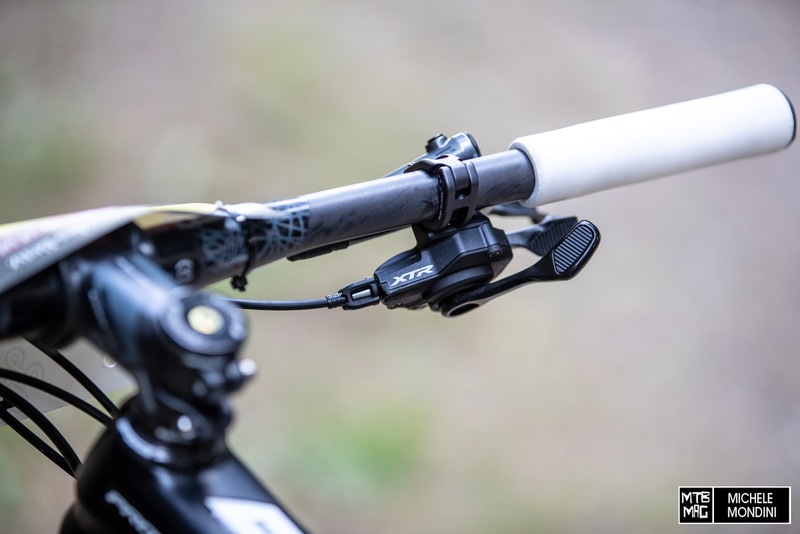 As well as that, Shimano now introduces a dedicated dropper seat post lever (SL-MT800-IL) with an I-SPEC-EV mount that’s compatible with all common adjustable seat post types in the market including the PRO Koryak Dropper post. 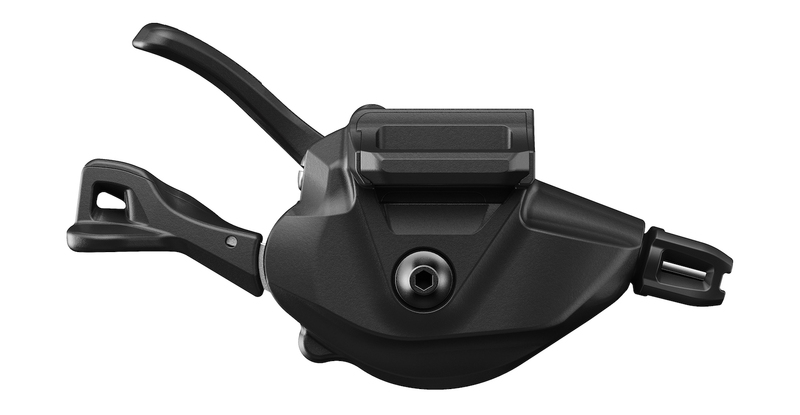 In addition, the shifters now have a lighter operation force allowing riders to make intuitive, seamless and minimum fingertip movements, bringing a substantial decrease in shifting force and operation compared to XTR M9000. Features like RAPIDFIRE Plus, 2-WAY RELEASE and MULTI-RELEASE carry over from the previous generation. New for the M9100 shifters though is an 11-to-12-speed converter (SL-M9100-R/-IR) on the rear shifter for riders choosing the ‘11-speed’ wider flange hub set-up. For 2×12 riders the front left hand shifter (SL-M9100-IL / SL-M9100-L) features an innovative new Mono Lever design with a simplified and intuitive operation, using just the one lever to shift up or shift down. 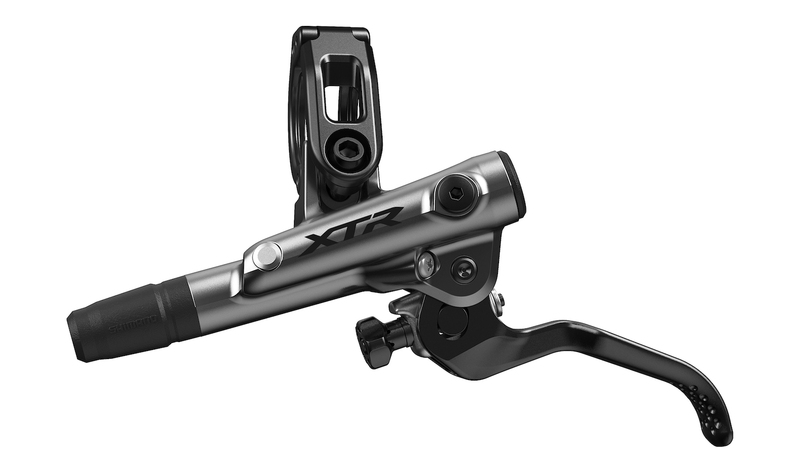 Building on what are already the standard to which all other brakes aspire to be, the design of XTR M9100 brake lever (BL-M9100/M9120) has changed with a repositioned clamp band and lever body. 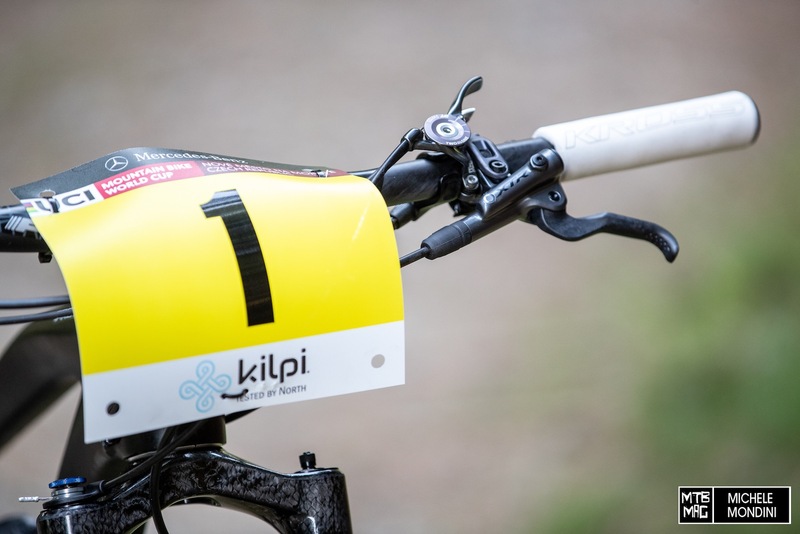 The clamp moves towards the middle of the lever body and the edge of the lever body is cleverly braced against the handlebar to create a stiffer brake with more direct contact feeling and improvement in control. The 2-piston (BR-M9100) option comes with a lighter weight XC brake lever with the option to adjust the reach of the lever arm. The 4-piston brakeset (BR-M9120) also features a dedicated brake lever but with a tool-free reach adjust function, free stroke adjust function and Shimano’s Servo Wave technology to give rapid pad-to-rotor action. Both calipers are made from aluminum, use a high rigidity brake hose and provide faster brake engagement with a shorter free stroke. Pads and rotors: To match the redesigned caliper shape the brake pad shape also changes. Riders choosing the 4-piston caliper need the radiator finned pads (N03/4A resin/metal), whilst the 2-piston calipers fit the pads without fins (K02/4S resin/metal, with optional K02/4Ti Titanium backing plates). The rotor design meanwhile uses a revamped ICE-TECHNOLOGIES FREEZA construction to either reduce weight or boost heat dissipation. The 140 and 160mm rotors shed 5 and 10g respectively, whilst the 180 and 203 mm rotors were 20 °c cooler during testing with the 203 mm rotor also saving 30 g (vs RT99) in weight. The rotor design meanwhile uses a revamped ICE-TECHNOLOGIES FREEZA construction to either reduce weight or boost heat dissipation. The 140 and 160mm rotors shed 5 and 10g respectively, whilst the 180 and 203 mm rotors were 20 °c cooler during testing with the 203 mm rotor also saving 30 g (vs RT99) in weight. 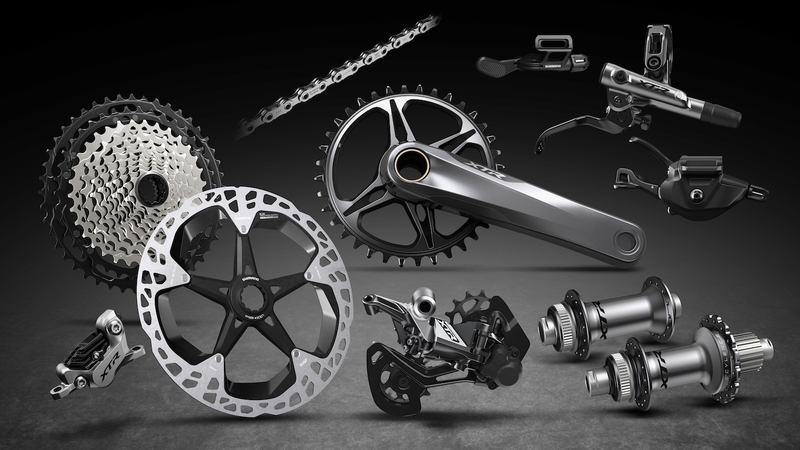 How many drivetrain options are available with new XTR M9100? Four: 2×12, 1×12 with 10-51t cassette, 1×12 with 10-45t cassette, 1×11 with 10-45t cassette and specific wider flange hub. We want to offer consumers the widest practical options. Yes, we see a clear trend in 1X12 drivetrains. However, we also know that some riders also want wider gear ratios. 2X12 offers a gear ratio that can tackle just about anything. For Enduro racing stiffness of the wheels is key, and for XC racers weight is one of the primary factors in component choices. 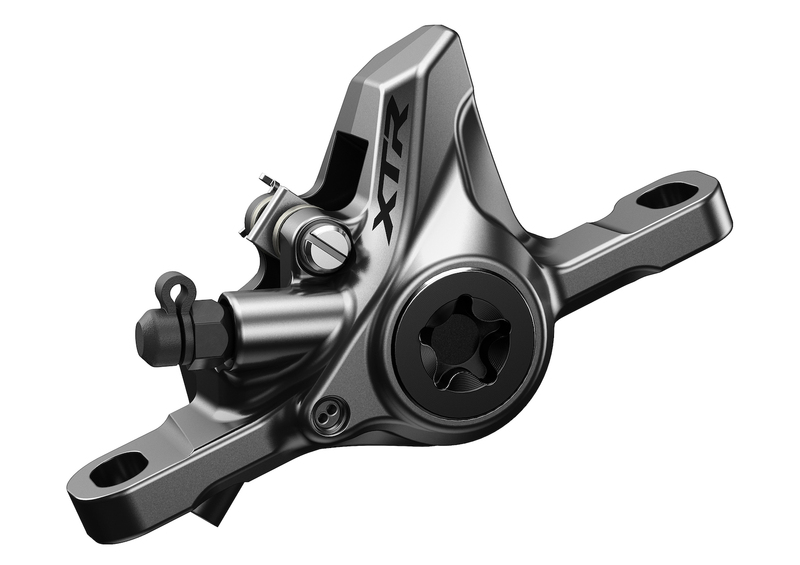 With the XTR 11-speed drivetrain, we use a special hub with a wider flange. This makes the rear wheel stiffer. A 12 speed cassette needs more space and doesn’t fit on a wide flange hub. 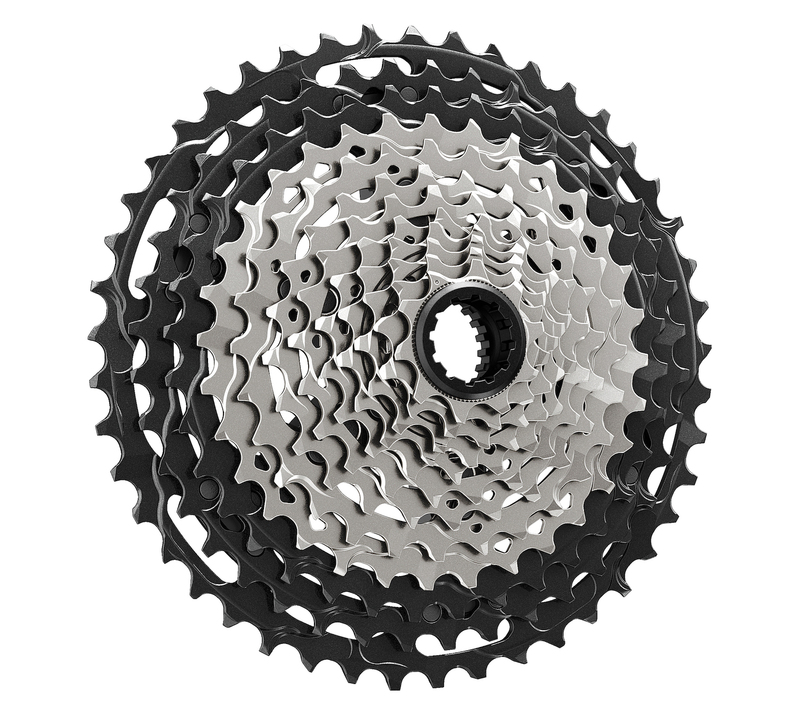 An added benefit of the 1×11 XTR M9100 cassette of the 1×12 version is a reduction in weight by the removal of the 51T sprocket. 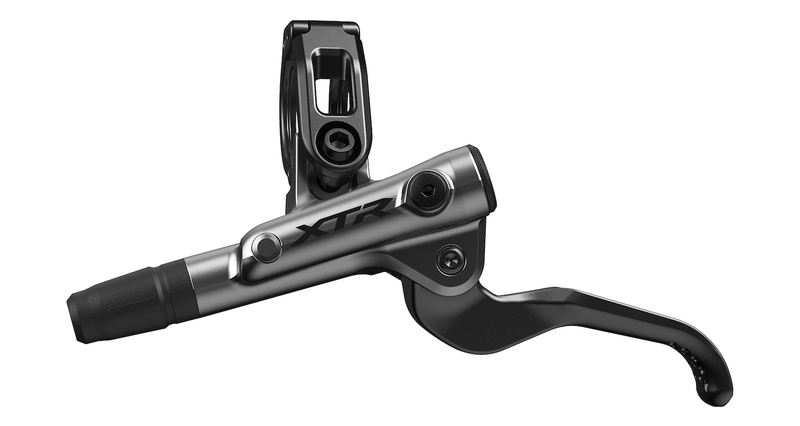 Why are you not introducing XTR Di2 at this time? Our first focus for developing new XTR was on mechanical shifting. Our Di2 technology is highly accepted in the cycling world so it is a logical step to make a Di2 version of the XTR 9100 group in future. How many points of engagement are there in the new SCYLENCE freehub? There are points of engagement approximately every 7 degrees compared to every 10 degrees on the old M9000 generation. What is the benefit of the 11-speed XTR M9100 option and will the cassette work with the normal 12-speed hub? Why are you not introducing new XTR wheels? During the development our focus was on the drivetrain. We decided to introduce hubs only at this stage because these are necessary to accommodate the MICRO SPLINE cassette. Why MICRO SPLINE (or, why another new standard)? Our 12 speed cassette needs more space on the hub. 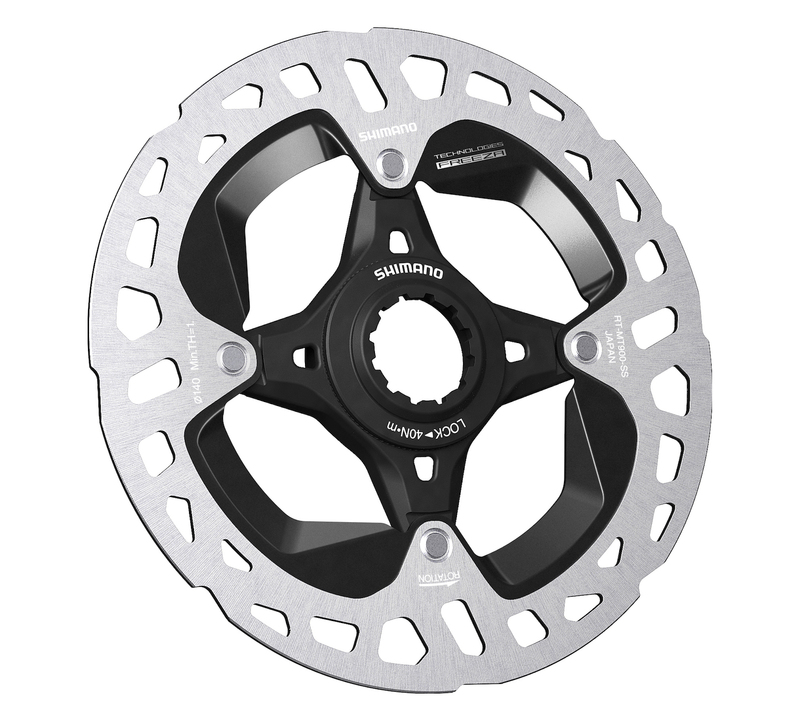 To keep the stiffness of the hub and the cassette and provide the best riding experience we are introducing a new freehub technology for 12 speed riders. 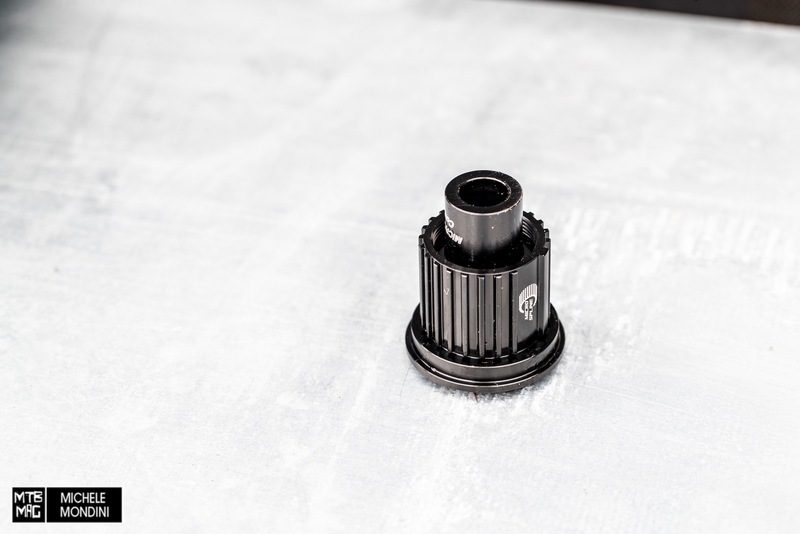 Do you need a specific MICRO SPLINE compatible hub to ride new XTR M9100? Can you use the new XTR MICRO SPLINE driver body on an existing XTR hub flange? Can the driver body slot onto an old XTR flange? Why can you not use an XD SRAM free hub driver on the wheels? We have a Freehub system developed to a specific level and standard in line with XTR. It is not designed to be compatible with other manufacturers systems. Is MICRO SPLINE an open standard and who is licensed to use the MICRO SPLINE hub? No. At this moment only DT Swiss is licensed. Can consumers service the hub? Yes, our hubs have a cup and cone bearing system which is serviceable. Why the move away from Direct Mount rear derailleurs (RD)? For the 12-speed drive train with the big gear range option we had to change RD construction. Due to the different movement of the Rear Derailleur (to accommodate the bigger cassette) a direct mount version of the RD is no longer possible. Does the cassette come in separate blocks? 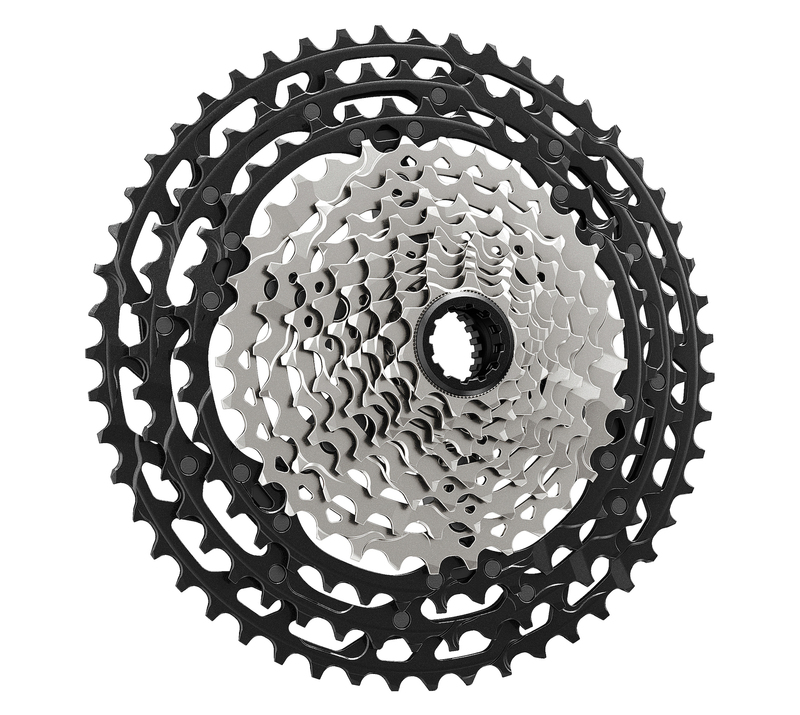 The cassette is built in 1 big block containing eight sprockets, five made from titanium and three from alloy, the four smallest steel sprockets are separate. Does the shorter GS version of the rear derailleur allow for a shorter chain and less chain slap? The GS version is for the 10-45 specification and keeps the same chain retention as the SGS version. Has the dogbone frame mount shape of the RD been removed? Are the brake pads for the 2-piston callipers the same style as current Shimano 2-piston brake pads? Yes and no, they are the same as the recent Dura-Ace / Ultegra road disc pads, so they are current but they are not the same as the M9000 MTB 2-piston pads. For the 4-piston brake callipers; are the pads the same shape as those used in the current XT/Saint/Zee 4-piston brakes? No the XTR M9100 pad is new and not recommended with Saint / Zee / XT 4-piston pads. What sizes will the chainrings be available in for the 1x option? How do the direct mount chainrings work? 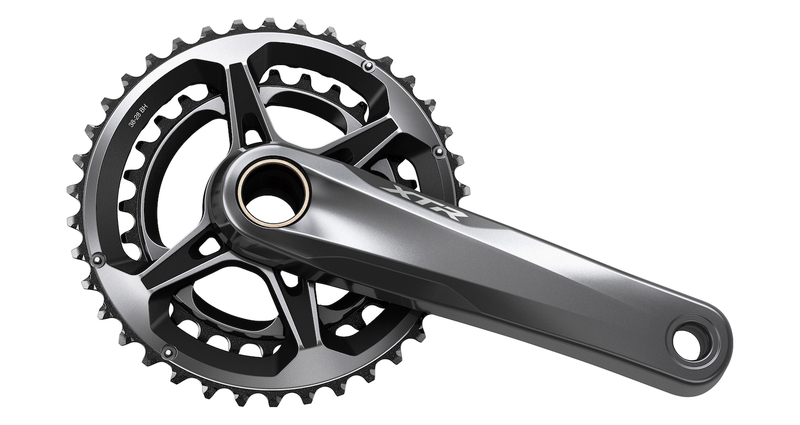 Is the DM system the same as any existing chainring designs or is it specific to the new M9100 XTR crank and chainring? This is a new system that uses a lock ring to mount to rings and the crank arm. How much quicker is the response of the 4-piston brake? The 4 piston does not have a quicker response than the 2-piston version but the braking power is around 22% higher for the 4-piston version. How has weight decreased and the cooling effect of the rotor increased? We have a new rotor structure and a new design to aid cooling. Can you mix XTR9000 components with XTR9100 components? No, the two groupsets are not compatible because of the new 12 speed technology for the chain and cassette. 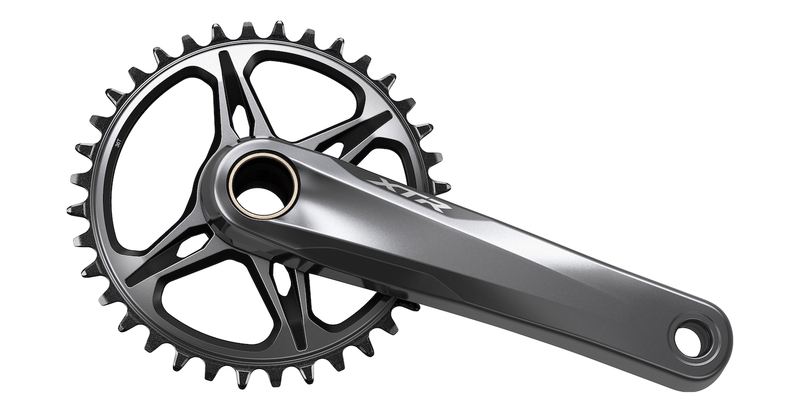 Is the new 11-speed cassette compatible with XTR9000 components? 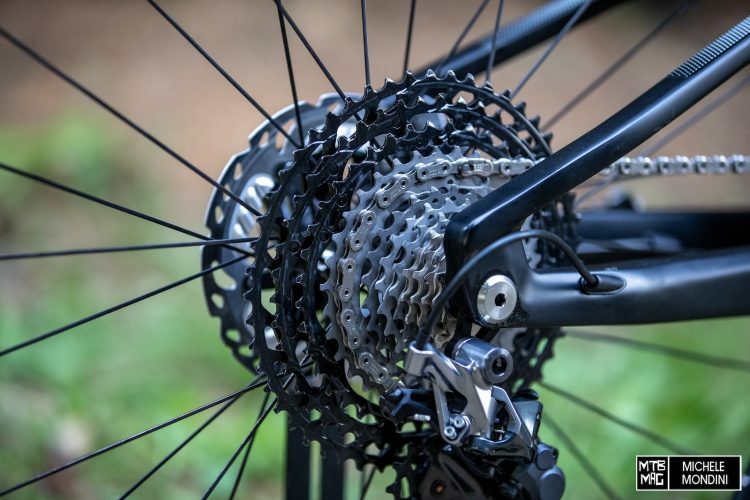 No, the wide flange 11-speed XTR 9100 cassette option designed for stiffer and lighter Enduro or XC wheels has 12-speed spacing so it is not compatible with the XTR 9000 11-speed drivetrain. Do you need a chain guide if you ride 1X12? The special chainrings (Dynamic Chain Engagement +) are developed to ride without a chain guide. However, for optimal chain management in specific disciplines (e.g. Enduro) we recommend using a chain guide. Does the bottom bracket (BB) stay the same? We have the same specifications for the Press Fit and threaded type BB. On the new Front shifter with MONO SHIFT technology where does the lever go once it’s pushed? Does it go to the same position every time even though it either shifts up or down? The lever does not release automatically after being pushed to change to the big ring. It takes a second push to release to the small ring. Why another i-Spec standard (or why another new standard)? We had to improve our I-Spec design because of new clamping structure of the Brake Lever. This means you can adjust the shifter laterally (ie to the left or right), vertically (ie up or down around the handlebar) and rotationally (by 60 degrees). The benefit of this is that i-Spec EV offers a greater level of personalization to suit your hand positions. To bring in this level of customizability and personalization though we needed to make a new dedicated and specific fixing mount. Do the wires and cables need to change if you ride 12-speed due to any increased tolerances? No, the same SP-41 and polymer coated inner cable will be used for the XTR M9100 series. 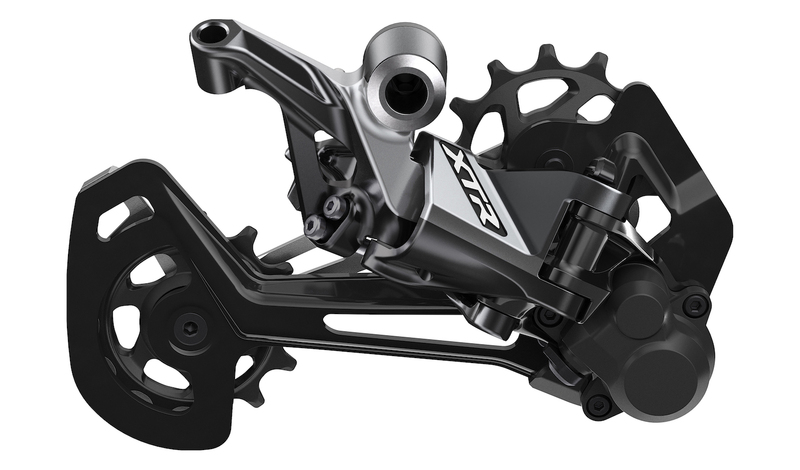 Will professional teams/riders be riding XTR M9100 this season? We are planning to have the top level Shimano XC and Enduro teams on XTR M9100 by the time products hit the market. 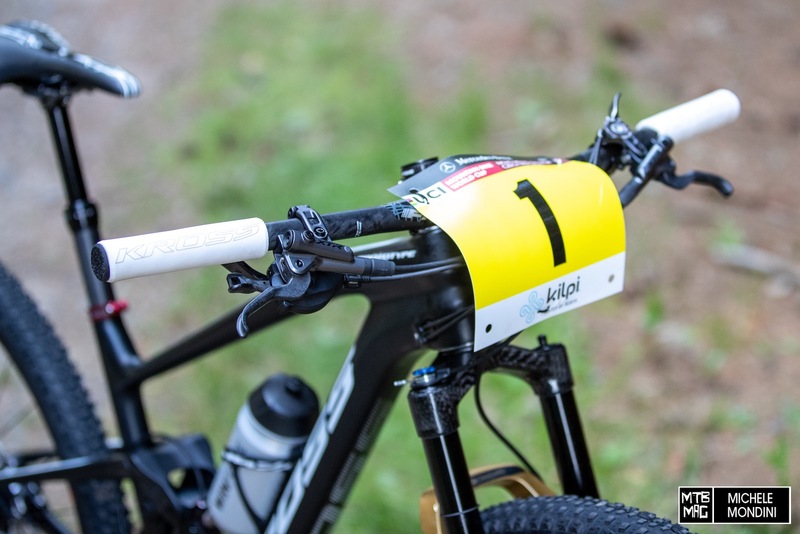 At Nove Mesto you’ll see Matheiu Van Der Poel (Corendon-Circus), Jolanda Neff (Kross Racing Team) and Lukas Flukiger (Thomus Racing Team) racing XTR M9100.